We caught Albert Hammond Jr at the Club Academy in Mancheser on his UK tour in support of recent album Francis Trouble. Support came from Yassassin, a five-piece girl band from London. Having never seen Yassassin perform before I was pleasantly blown away by the compelling stage presence and pure talent of this band. The Club Academy stage is small and dark, but they lit it up with colourful outfits, loud personalities and powerful songs. The Riot Grrrl movement has made a massive return in 2018 and Yassassin fit into this with a slightly more pop approach, being one of the very best I’ve come across. Stand out songs included ‘Cherry Pie’, ‘Social Politics’ and ‘Pretty Face’, with new single ‘Wreckless’ thrown in there. 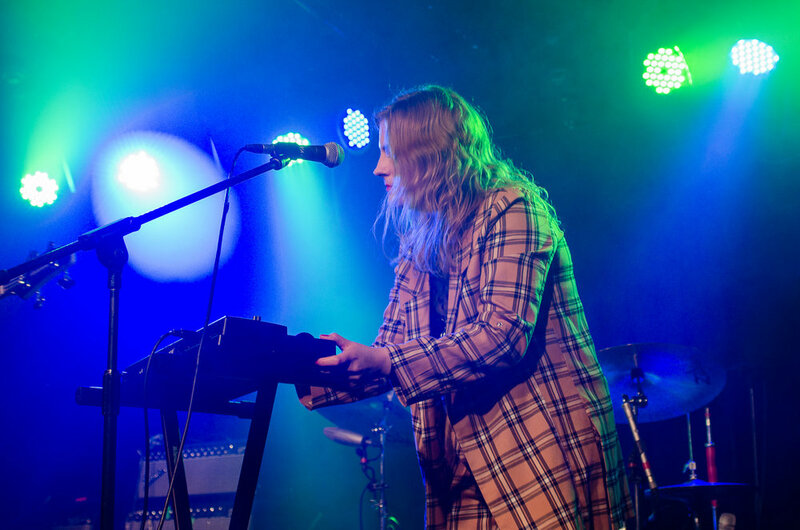 Backing vocals come from each member of the band, with strong lead vocals coming from Anna Haara Kristoferson, an energetic frontwoman. The band were clearly loving it, with this intimate venue allowing us to appreciate it up close. With a name to remember, big support slots already in the bag and a sound like that, they’re definitely a band to watch out for. 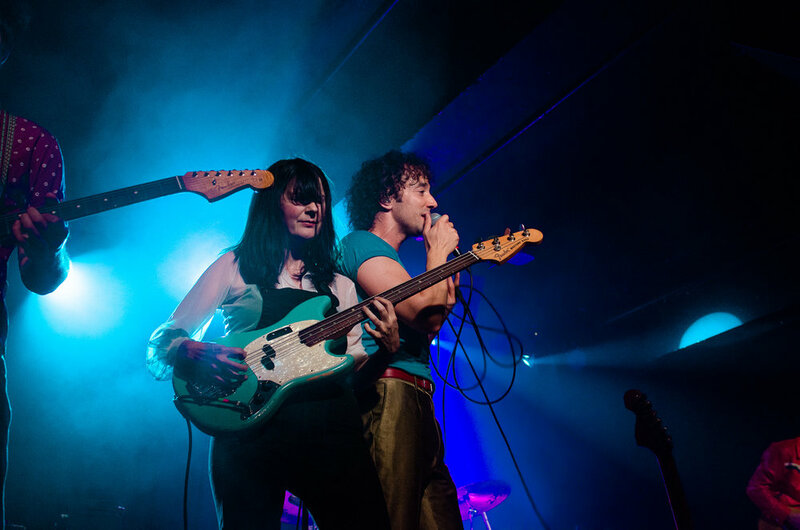 The small venue filled up as the time quickly approached for Albert Hammond Jr and his band. After seeing him smash his support slot with Franz Ferdinand earlier in the year, we couldn’t wait to see a full set by AHJ. Since the release of his fourth solo album, it’s been none stop for the Strokes guitarist. After recently addressing Alex Turners opening lyrics on the new AM album, which state “I just wanted to be one of The Strokes”, this gig proved just why Turner may have said that. The humble attitude of Albert Hammond Jr rubs off on us, he’s a cool guy, great musician and genuinely loves performing. I’ve said it before, but I’ll say it again, maybe it’s time we stop referring to him as ‘one of the Strokes’ and show the recognition he deserves as a solo artist. This gig proved he was made to be a front man, and he is killing it! Playing a significantly smaller, but all the cosier, venue than the last time he was in Manchester, this didn’t change the show, in fact it made it 100% better. 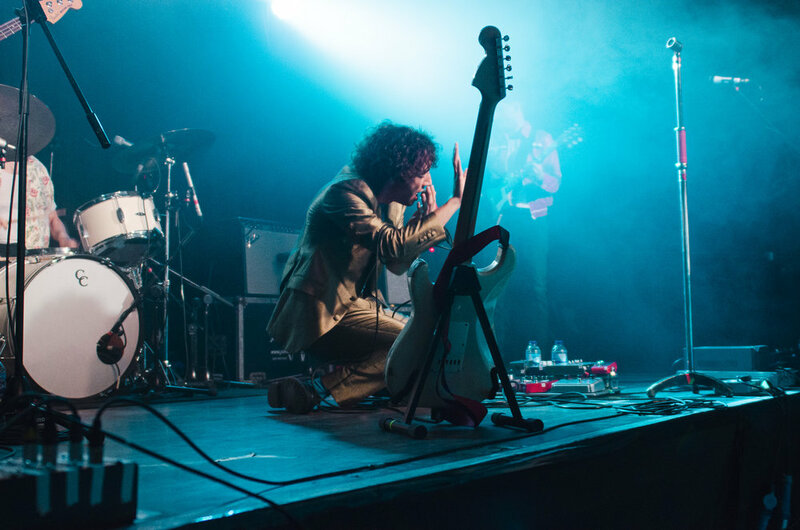 Albert Hammond Jr bounced on stage wearing a metallic silver suit, with the rest of the band bringing along a bold attitude, we knew they meant business. Going straight into ‘Dvsl’, the opening track of new album ‘Francis Trouble’, we knew we were in for a good night. Quickly reminiscing about the support slot with Franz Ferdinand, Albert says “THAT band”, with emphasis, implying that he’s a big fan. It also soon comes to life that AHJ and band have spent a number of nights in Manchester, calling this the “base camp” for the start of the tour. If only we’d have known that before! As a frontman, he interacts with his audience like no other. By the second song, he had already jumped onto the amps and made his way into the crowd, which resulted in him starting a pit with fans in the middle of the crowd! He is admired and a real natural performer, it was a pleasure to share this rare experience with everyone else in the room. Throughout the set it was clear that AHJ was having a great time, making jokes and comments throughout, but the simple words of “I do appreciate you very much, you guys are awesome” brought huge cheers. Stand out tracks from the new album included ‘Set To Attack’, ‘Far Away Truths’ and ‘ScreaMER’. With well-loved older songs ‘GfC’, ‘In Transit’, ‘Holiday’ and ‘Everyone Gets A Star’ gaining much singalong appreciation. In a small venue, an encore is never expected, but we got it anyway! Albert once again got into the crowd to give everyone that final send off. When finally back on stage, there was time for a last comment about the venues low ceilings and one more song. ‘Muted Beatings’ was a fitting ending to this monumental show. We’re not sure what plans entail for the future, but in the meantime, it’s great to see Albert Hammond Jr pursuing his solo career and filling the void. He was born to be a frontman and absolutely kills it with his passion, strong vocals and endless energy. This was a phenomenal gig (that cost under £15!) and made for a fine bit of Tuesday evening entertainment.